Janice just flew home from Houston after spending 10 days here. We worked those 20 hour days getting ready for the market. We had a great time. We met so many new friends and got to touch base with some old friends too. We debuted 10 new patterns. 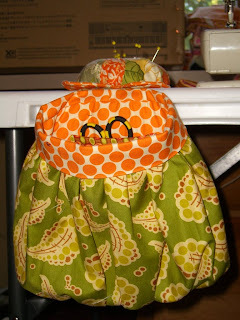 Eight quilts, a new purse, and of course the "ABBEY BAG." 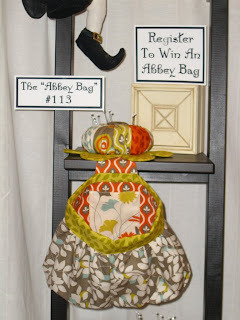 The Abbey Bag was a big hit and just as cute as can be. We had them all over our booth. A picture is worth a thousand words, so let me show you the show. 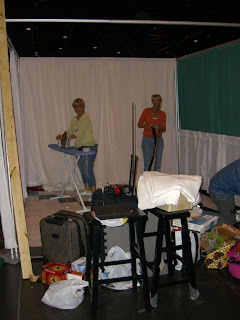 Here is the booth we started with. Not much. So much stuff, so little space. Janice's daughter Nellie flew in to help us with the show. We couldn't have done it without her help. 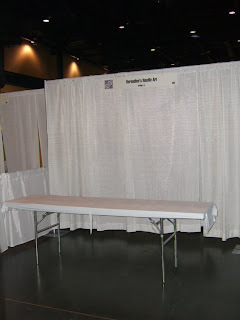 We had a 10' x 10' booth, which isn't very big. We started with the floor. It was fun to put together and added a great touch. We also put up some fru fru berries to soften the look. Each wall represented a different look, but it all seemed to work. 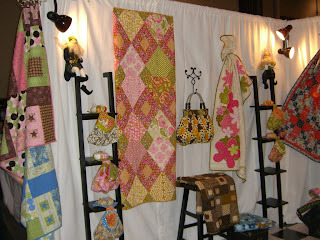 We had two quilts hanging in Patty Young's booth. 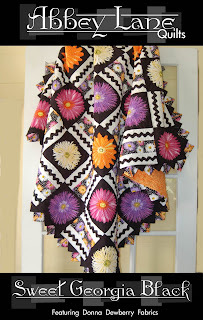 Her fabric is beautiful and we loved working with it. Thanks Patty. 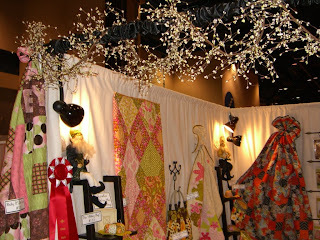 One of the highlights of the booth was winning SECOND PLACE for Single Booth decoration. This is a big deal and we were very honored. So, the website has all the new patterns up and we are in business. Have a great week and thanks for looking. Can you start a blog with a P.S. at the beginning. 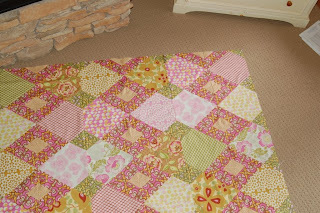 We always seem to be working backwards but this is the finished top for andalucia earth, still will need to be quilted. Way to go Janice. 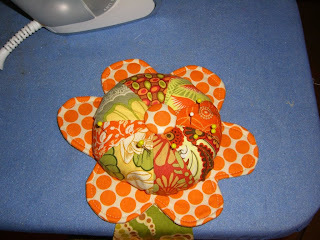 check the design she achieved through fussy cutting. This quilt is amazing in person. 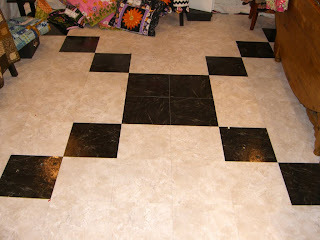 We will have the pattern and great pictures next week. 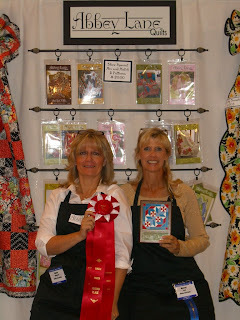 While Janice is home slaving behind the sewing machine and quilting machine, I have been traveling the country. I started in a car saturday night in houston, on sunday I flew in a plane from albequerque to dallas to new orleans to orlando. Landed late sunday night. Janice and I blitzed through a thousand details monday, then i caught a plane monday at 5 pm to phoenix and then to salt Lake city. it was 25 degrees when i landed. 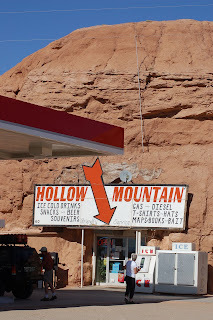 This is the mountain i grew up on. My dad had 2 inches of snow on the lawn on sunday. Now the good stuff, Janice is just about finished our second quilt using the new Basic Grey Fabrics. 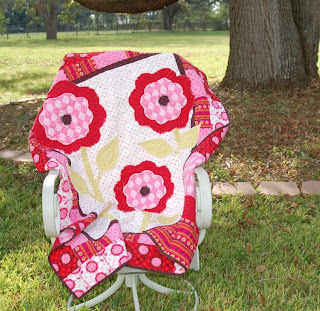 It is a fun, easy quilt that can be made in scraps or your favorite new fabrics. 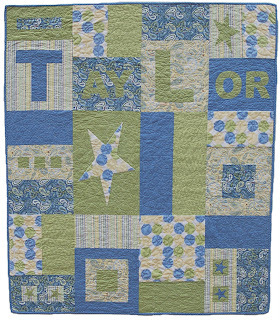 The pattern to this and all the other new quilts will be available next week on the website, just in time for market. 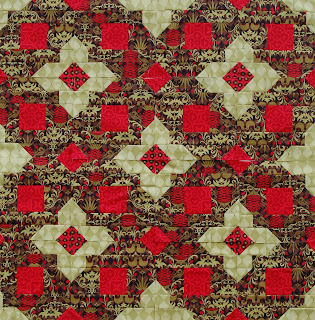 This quilt still gets a strip of red on top and bottom. I also took a close up so you could see how cool the piecing is. We used all 39 fabrics in the Basic Grey collection. This fabric will be available in November. 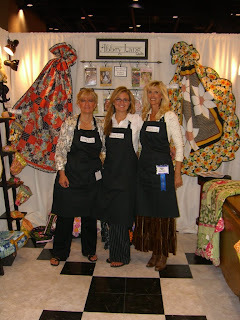 We told you about Patty Young, great new designer from Michael Miller. Janice almost has her second quilt done. The collection is called Andalucia Earth and the colors are very rich. 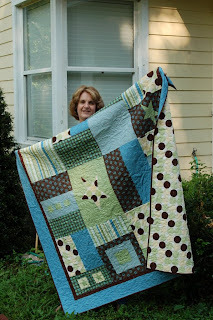 This quilt is a piecing masterpiece, one reason Janice is doing the sewing. She loves the intricate work, did I tell you she is doing a Dear Jane. 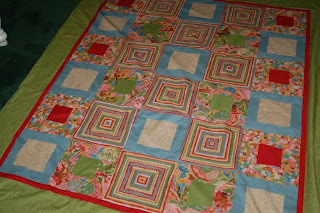 This quilt still has borders that will be put on it. Ok here are the first borders. last one will be done and we will throw up a picture of it, too. We are working very hard night and day to get everything done. I fly back to Houston this weekend and Janice flies into Houston Tuesday morning. 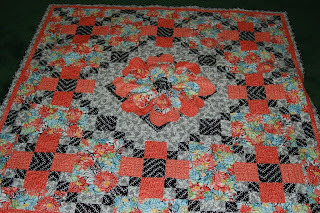 Here are two pictures of Patty's other quilt, "Miss Molly"
We will keep you updated with the sneak peaks. The real thing will be on the website soon. I have now been in Florida for 6 days. 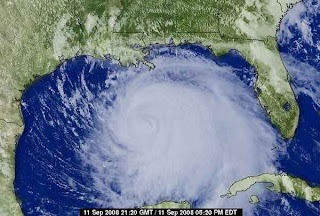 I will be returning to Houston tomorrow. Janice and I have accomplished a lot, but there is soooooooooo much more to do. Before I get to the good pictures, I wanted to share with you pics of some of our pets. Actually, they just happen to live in the yards at our houses. Let me introduce you first to Sassafrass. She is a chicken, and she stands outside the studio and waits for us to feed her. She belongs to Janice. 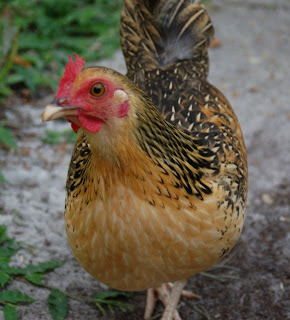 A few months ago, Janice had 12 chickens and roosters, but, saddly, she is down to one. I am staying out in the country outside of Houston. We have numerous squirrels, a family of baby racoons, two large hawks, and this cute guy. 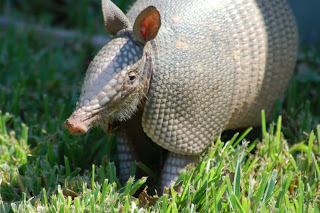 His or her name, I don't know how to tell on an armadillo, is NOSEY. Normally armadillos don't come out in the day, but this dumb thing runs around the yard all day, sticking his nose in the grass digging bugs. 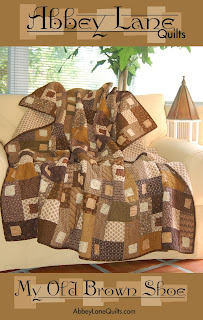 Ok, enough of the animals, back to the quilts. I want to spend a minute to tell you about one of our friends. Her name is PATTY YOUNG. 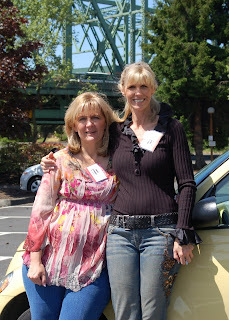 We met Patty at market in Portland last spring. 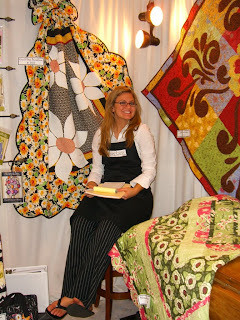 She has designed a new line of fabric for MICHAEL MILLER. It is called ANDALUCIA, even the name is beautiful and the fabric is better. 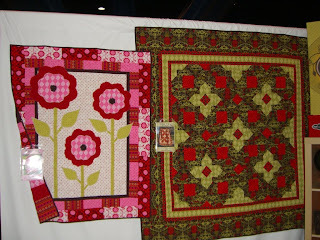 We designed two quilts for Patty's new fabric to show at market. The fabric arrived in Florida, I followed quickly, and we began. The quilt is coming off the quilt machine in about an hour. It will have some additional elements added, but we wanted to give you a sneak peak. Make sure to go to the bottom to see the finished quilt. 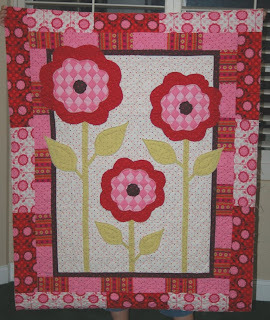 This quilt is perfect for a little girl, or even an old girl like me, I just want to hang it on the wall. We added this striped backing and it made the back almost as cute as the front. The colors and patterns in this line are great. Ok enough on that quilt. 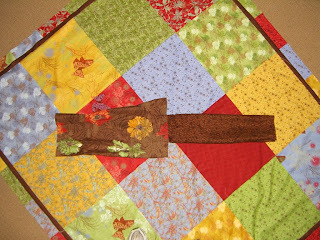 The second quilt is still in blocks, so no sneak peak this week, but check back. It will be worth it. 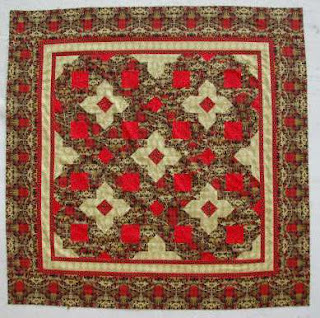 It is out of rich greens and browns with splashed of red and is a true quilters quilts. It is a piecing quilt, so Janice is sewing it. Did I tell you that Janice is a better seamstress than me. 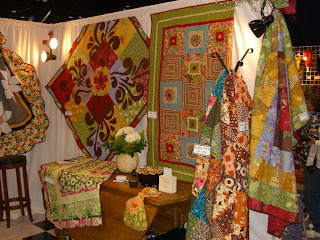 It is very sophisticated and I have already claimed that the finished quilt will be mine. Well, I can't say enough about this line other than to tell you to go to Patty's blog, http://www.modkidsboutique.blogspot.com/ and you can see the whole line. Only the binding to go. Janice said the first two pictures were tooooo ugly. I like to use just ok pictures cause I want you to see the best when they are done, but this one is too cute to not show you the finished quilt. Market is less than three weeks away. 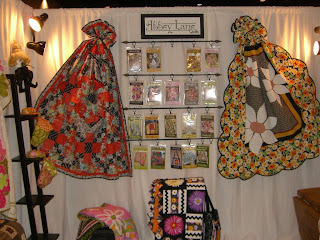 We have two more quilts, lots of abbey bags, a purse and an apron to finish, oh yeah, the patterns to go with them. Hope we make it. 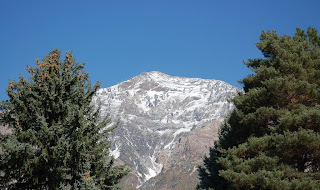 Thanks for reading and please, leave a comment, we love to know what you think. So many quilts, not enough time. I have stopped for a minute just to give a little update. Janice is slaving away in the stu dio as I write. 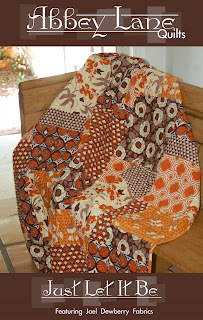 She has one quilt on the machine, this is the CHEZ MOI fabric that got lost in the mail. Here is the sneak peak before it hit the machine. It will have some beautiful embellishing after it is quilted. It is a combination of old meets new, and, in my opinion, moda's chez moi collections are one of their best. 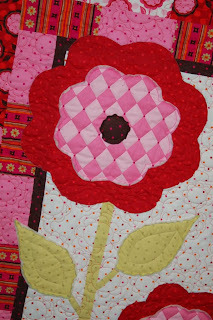 Look for the finished quilt pictures in the next couple of days. 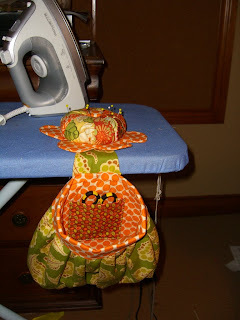 I have flown to Florida for the week so Janice and I can sew, sew, sew. We are getting about 4 to 5 hours of sleep a night. Two quilts have been finished so far. 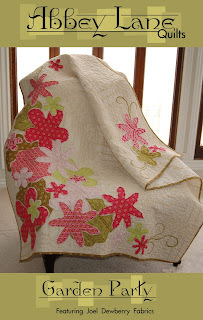 The First one of the machine was the pink diamond quilt made with Westminster fabrics. It is absolutely my favorite. The pattern will be ready and on the website at the end of next week. We have already had quite a few orders for it. I LOVE IT! 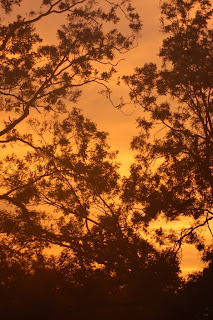 The second one off the machine was MARMALADE SKY. 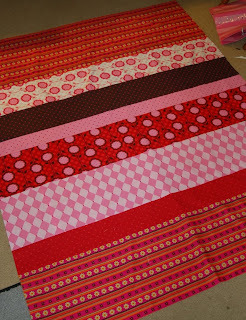 This is such a great generic quilt for whatever fabric you want. And besides, you can never go wrong with black and white chains. 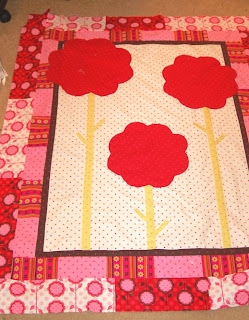 Last item for the day, we are so excited to show you our first picture of a quilt made from one of our patterns. Our friend Marcia, who helps us out once in while, gets the privilege of shopping in house. She and her daughter decided to make the baby quilt, "Baby, It's for You." 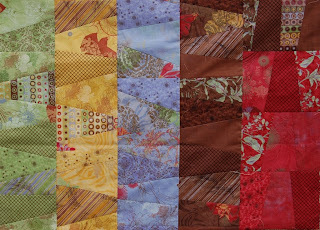 Marcia added two borders and shifted the color scheme. It is beautiful. Thanks Marcia for sharing. We really mean it when we ask you to send us pictures. It just makes our day to see that something we have made has inspired you. We have three more quilts to finish in the next three days. 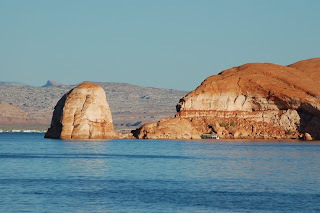 We will be posting some pictures as we go. Wish us luck. "Sweet Georgia Black" is the quilt for the magazines. 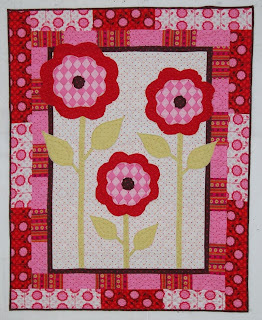 It will be in Quilters Newsletter in July. 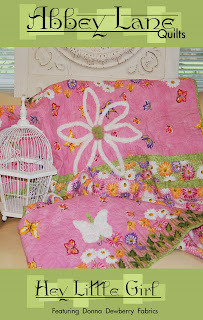 This is our little girl quilt using Donna Dewberry's new fabrics and some Blooming Chenille for the flowers and butterflies. We named this quilt "Just Let It Be" because we kept trying to add different things but finally we just left it alone and it was great!!! 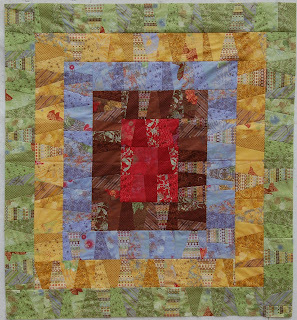 "Garden Party" was one of our first quilts with Joel Dewberry's fabrics. I had a hard time quilting this one because it is free-form kiddiwampus quilting and that is hard for me not to want it to be perfect. "My Old Brown Shoe" is the perfect photo. If we could only get all the pictures to look this good.